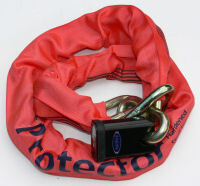 Package Deal: Protector 13mm Chain, Squire SS50CS Lock Discounts Apply ! 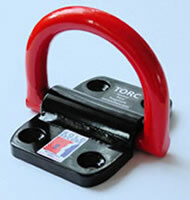 Torc Ground Anchor Series II - Easy DIY fit. Folds flat. Sold Secure Gold in all categories (for the resin-based kits) and Motorcycle Gold, Bicycle Gold, ATV/Quad Gold, Car & Commercial Gold (i.e. everything but Caravan Gold) for all other fitting kits - The only anchor on the market with such a high level of approval! Fitting kits for Concrete Floor, Brick Wall or Van (shown in photos 2, 3, and 4, respectively), also injection resin kits for more demanding situations, Block Wall kit when there is no other option and an extended mounting helps to compensate for a poorer base/substrate, and also a Concrete-in kit when fresh concrete is being laid. We detail the contents of each kit.. Drill bit: 12mm diameter included for Concrete Floor/Injection Resin, and 16mm diameter included for Brick Wall and Block Wall kits. SDS-Plus drill available at extra cost. No drill bit included in Concrete-in or Van kits. Easy DIY fit. Easy-to-follow and thoroughly illustrated instructions are included. Available for wooden or metal sheds. Please click here for important information on suitability and further details. Big Savings with Package Deals - Buy a lock/chain/etc at the same time and save!